I love my practicum! I just wanted to get that out of the way. Today, I started by working on the bibliography on women. While I was working at my desk, I got to meet historian and archivist Michael Landon. I tried to keep my cool but I am such a fan. His work was very helpful to me in my research about Mormon pioneers in early California. He talked to me for nearly half an hour about the talented people who were helping me, about his mentor when he was a graduate student, and the opportunity he had to mentor my boss, Brandon Metcalf. Mentoring is where it is at! From 9-11 I worked the reference desk, again, only this time with librarian April Williamson. Since we were slow, I got to ask questions about the software and input fields. She was so patient and thorough. Next, I researched the answers to a patron request. Four rolls of microfilm later, I found the answers and typed up the e-mail. Yea. I lunched with the conservation crowd and then started a new project with Brittany Chapman, my reference supervisor. Brittany is an excellent researcher who was educated at BYU and in the UK. Her specialty is women’s studies. The Young Women’s organization of the LDS Church has commissioned Brittany to find quotes from girls in the 1870’s that would inspire today’s youth. She and I read hand written newsletters written by girls in Brigham City and Bountiful, Utah. We were looking for personal accounts and testimonies of faith. The first box we read had photocopies of newsletters from Brigham City, Utah in 1877. 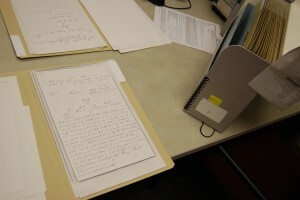 The second box contained the originals of a newsletter from Bountiful, Utah. 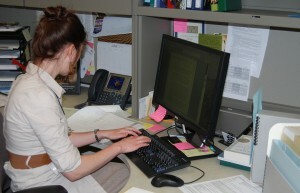 Brittany is typing up the passages we selected from the 19th century newsletters. Tomorrow, I will make more progress on the women’s bibliography, hopefully answer another patron request, take another stab at the reference desk and do other educational Archiventures. Meanwhile, I love my practicum. This entry was posted in Reference and tagged patron request, reference. Bookmark the permalink. What a day, it sounds absolutely amazing. I am still majorly jealous. You have the coolest practicum, ever! I just wish I were planning a visit to Utah this month!! If it is coming across in my blog that this place is amazing, then I must be doing something right! You would love it here, especially this week. Right up your alley. Wish you were coming up, too!